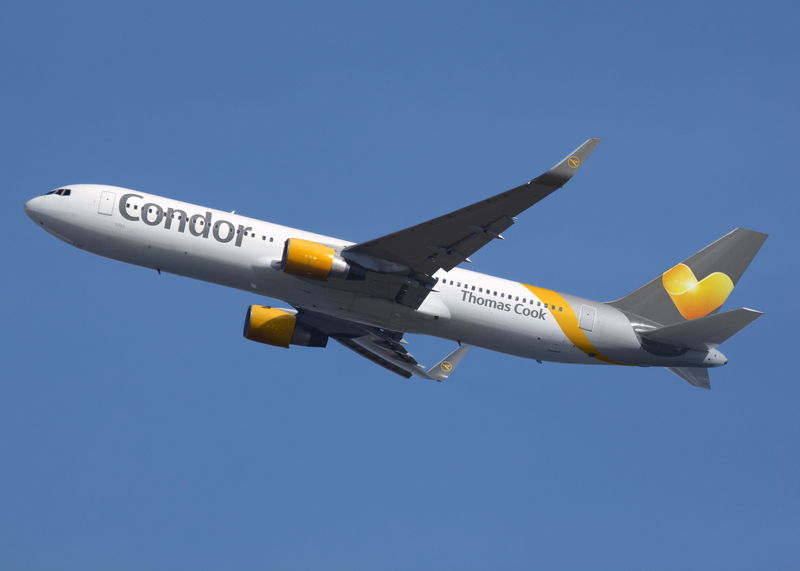 i've read sometime ago in an Article on the German Site airliners.de that there are Plans to announce new Orders for Condor's ageing Fleet of 767's this Year, yet it seems no Announcement has been made whatsoever. My Question now is how could that Order look like and especially they stated in the Article that the Planes would also be there to fulfill Roles inside the other Thomas Cook Group Airlines, which might have an effect on the outcome of which Type of Plane they are going for. Old Eurowings 1993 until 2010, gone but never forgotten ! The best bet has to be second-hand A332s. I would surprised if it was anything else. Age between 17 and 27 years, new cabin installed 4 years ago...i don`t see a reason to renw the fleet within the next 5-7 years. But if they do, second-hand A330 would also be my guess. Get a couple 788s for the higher-demand routes? Then that’ll hold them off till around 2027 when the 797 can hopefully replace the rest. Surely just 330's replacing condor 767s and hopefully standardising (and getting rid of the air tanker one without premium) would allow them more flex across the group. Ultimately they have to be a 330neo candidate? I think all signs point to the LH group starting to absorb significant numbers of newish-build 333s coming off short-term lease, and some of these seem like they would be good fits for Condor. There may also be an order for new 787s or A350s, but those are expensive and would only likely relate to Condor if they end up replacing LH or LX 333s which get handed down..
What does Condor have to do with LH? LH doesn't own Condor. Thomas Cook does. That suggests A330s quite directly as the replacement, whenever it happens. I'm a few years out of date, apparently! Somehow I missed that they are now a Thomas Cook airline. Still seems used A330s are the answer. Would depend upon how long they plan on keeping their B753's as they have cockpit commonality with B767's. However the A330's would have commonality with the A321. Maybe order A321 Neo's or LR's along with second hand A330's? I always thought Condor would get some 787s. Replacing 767s with used A330s? Condor have almost 20 767s if I remember well. Are there enough A332s available at the second-hand market? Are there enough A332s available at the second-hand market? The thing is, if they go for second Hand A332's i guess they would like to go for the ones with the RR Trents. Now comes the Question on how many second Hand A332's are on the Market that have the Rolls Engines and are up for Sale. I always thought that the Trent on the A330-200 wasnt as often ordered as it was on the A330-300 so that might make things a bit more interesting. .. a little mouse tells me Qatar A330´s are on the way, make of it what you will! A few years out of date 'apparently'! Somehow I missed that they are now a Thomas Cook airline! You can make that as being nearly 15 years out of date! In an article on ch.aviation today it's been suggested by Barclays Bank that Thomas Cook should sell their airline operations to offset their recent profit warnings, if that happens which I personally think will happen it might not be the current management making the decisions regarding replacing the fleet. A new owner might have a completely different view on any possible fleet replacement but whether it's new builds or second hand examples it makes perfect sense to simplify the fleet with A321neo, A321LR and used A330's. The most favoured option seems to be used A330s. I would expect that a decision is being hold off until it is clear how the Brexit is going to look like. The 757s will be around until 2030. 330 is the most probable replacement although some Neo's would be a good solution. Getting used 330's aging between 10-15yrs is not a long time replacement. Why do you think the 757's will be around till 2030? The frames will be almost 30 years old by then, it will be much cheaper to replace them with A32xx/797. There is absolutely no way that the B757s will be around until 2030 not a chance in hell, if that was the case it would mean that Condor would more than likely be the very last operator of the type. I should imagine that they will all have left the fleet within the next five years if not sooner but definitely not 2030 that's 11 years away. I also see the secondhand market for the A330's as quite small for the coming years seeing that RR powered A330's are also less sold compared to the GE powered ones. Besides this the secondhand A330's of 10-15 years old might also not be a long term solution looking at that age. Are the A330NEO's not a better long term solution seeing that they can most likely get them quite soon too? I know it is more expensive but the trade off is that you have an airplane that you won't need a replacement for the coming 20 years. 10-15 year old A330s (at time of delivery) still give Condor -10-15 years of use out of them. It’s not like Condor doesn’t mind operating older frames, most of their 767s date back to pre-1995. ...you mean aside from the fact that they have "Thomas Cook" written directly on them--- for the better part of two decades. Don't forget, ordering NEO's would be a better longer-term investment when it comes to oil price shocks and CO2 taxes. Replacing a bunch of 1986-era airplanes with half life 1994-era airplanes is just a poor investment longer term. The one benefit of ceo's is that it will give Condor commonality with TC UK/Scandinavia who already operate ceo's, so can be transferred across the group more easily than 767's which Condor is now the sole operator of, as well as the oft-discussed similarities with the Airbus narrowbodies. I agree though that neo's would represent a better opportunity. I've mentioned this before, but a group-level order for deployment across all airlines might be the way to go here like they did with the A321's and I've always argued the A330neo would be the perfect fit given TC Group's fleet at present, though I'm aware that's not stopped airlines that would seem to be natural A330neo operators going for 787's instead. Some of the A330ceo's at TC UK are nearly 20 years old and date back to Airtours days, so thought would need to be given either now or in the next few years about what to replace them with. Would think it’s highly likely to be a 321 neo / 330 neo replacement . What are the primary destinations for the 757-3 . Can 321neo cover all these with similar capacity ? If the plan is to place an order for the entire Thomas Cook fleet, then going for the A330NEO makes even more sense because they can negotiate a better price. And again, I also see a brand new airplane as a better investment compared to secondhand airplanes, especially over the long term. In any case, good luck to them and I'm looking forward to seeing which airplane will replace their 767 fleet. I have a very trustable source for that. That's at least the plan from half a year ago. I also see the secondhand market for the A330's as quite small for the coming years seeing that RR powered A330's are also less sold compared to the GE powered ones. There's a couple of relatively new ones just taken back from WW looking for a new home. Also a lot of the Chinese A332's were RR powered which will soon be replaced by NEO's or dreamliners. The 753's are mainly used on the Med-Sea Destinations and down to Egypt for the likes of HRG and SSH, they are the workforce on almost all 4-5 Hour FLights for the DE aswell as far as i can remember. Even thought they share the same Destinations as with the A320/321 Fleet of DE. So the A321neo might be the way to go as a replacement in the long term for the 753's, which given the fact that they operate pretty new A321's might be a hindsight that we will see the A330 either in the 200/300 Version or the A330neo in the Future with DE to keep Fleet Commonality. Yet in the Article i posted in the beginning they also stated that the 763's are planned to have 10 more Years of Life in them. Fun little anecdote: My Mother used to work for DE at FRA for around 10 Years, and almost always got Home annoyed by the 763's as being unreliable and being prone for going MX in the last Minutes before scheduled Departure, i recall one 763 being extremely prone for doing that which is D-ABUZ nicknamed "Uniform-Zombie"
Maintenance is not the only reason for UZ being called Uniform Zombie. It was this aircraft that was involved in the incident in Porlamar. "Get a couple 788s for the higher-demand routes? Then that’ll hold them off till around 2027 when the 797 can hopefully replace the rest." Why wait for 797s when they do not exist but A321 LRs and B737-8 Max do? To me it makes more sense to get the B787s with a size comparable to 767s and much lower operational costs. Condor has been around for a long time and I doubt they would go away anytime soon. The A332s are an option but for how long? Seeing as the Fleet is composed of right now the mixture between A320/321 and the 757-300 aswell as the 767, my bet is that they will opt in the long term for 787 as 767 replacement at one point and the A321neo in some Years as replacement or additional Planes for the already existing Airbus Fleet. In the longterm i would guess that once the 753's will leave DE's Fleet the A321 will take over that Role, the 757 and the A321 basically share most of the Routes alltogether it just depends on where the Planes are based at in DE's Network. On top of that i guess that DE might be even the last Operator in the Future to fly the 757-300, just depends on what FI and DL have planned for their Fleet.